Your temporomandibular joint, or TMJ, refers to the set of hinges on your jaw that allows it to move smoothly whenever you eat, speak, laugh, or yawn. Like other joints in the body, it can sometimes become strained or misaligned, leading to what is called a TMD, or temporomandibular joint disorder. This can cause a wide variety of dental and overall health problems, so if a stiff, painful jaw or persistent migraines are common issues for you, you should contact Dr. Gabriel Nossa today to get the relief you need. 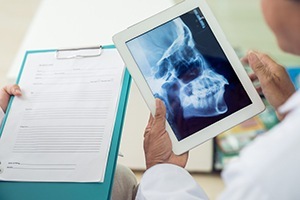 A TMD can be caused by a wide variety of factors, but the most common tend to be stress, injury, arthritis, and a misalignment of the bite. When the teeth don’t quite come together properly, this causes the jaw to make slight adjustments whenever you open and close your mouth, and this puts quite a bit of strain on the joint and adjoining muscles. When you come to see us and we suspect that you have TMD, we’ll use a variety of tests and scans to reveal the root of your problem so we can quickly start treating it. When the bite is slightly misaligned, this can sometimes cause muscle tension and pain in the jaw. 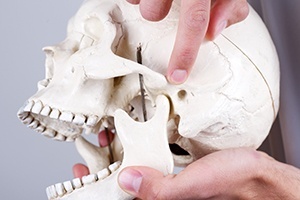 In order to align the bite and relieve this discomfort, we can perform what is called an equilibration/occlusal adjustment. Despite that being a mouthful, the treatment only entails slightly reshaping a few teeth in order to help your bite come together smoothly. This will allow the jaw muscles to relax, and the pain should eventually go away. We can also prescribe the use of an occlusal splint, which is a custom-made orthopedic mouthpiece that slightly shifts the jaw into a more comfortable and natural position. This will allow the joint and muscles to relax and heal themselves over time. 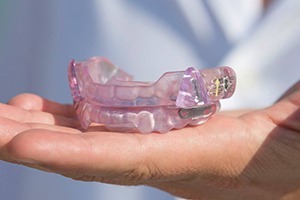 Many patients are able to stop wearing a splint after a few months of use, though others will need to keep wearing it in order to maintain results.